This weekend was full of fun! The big thing on my calendar was the Om Kalthoum Tribute Show on Sunday. Anela had told me about it a few weeks in advance, and I was really looking forward to it. Duncan and I picked up Anela and her friend Marina from Anela’s place. It was my first time meeting Marina, and it was very nice getting to know her during the ride! She danced with Anela in the same set. They performed a shamadon, which is an Egyptian candelabra dance. I hope I got that terminology correct! I was sure to have at least taken photos, but Anela asked me to record it, so I did that. I couldn’t get closer due to some distractions on the side (which also caused kept causing me to lose alignment sometimes), but at least I got it recorded! It was really awesome, and the dancers were quite skilled. The amount of talent my friends have is amazing. After their set, I went to the bathroom and found the dancers in the back. Of course, I had to stop for some photos. And I had to get one with another dancer at the end of the night too, Bethany Rose, who was also one of the organizers! The event was held at Byblos in Los Angeles. The food was delicious, and it just kept coming too. They were also very accomodating. The show started at 8:00, but we got there at 5:40 or so because the dancers needed to be there by 6:00. I asked what time we could come back, and they ended up letting us wait inside, even opening the bar so Duncan and I could have some drinks while we waited. 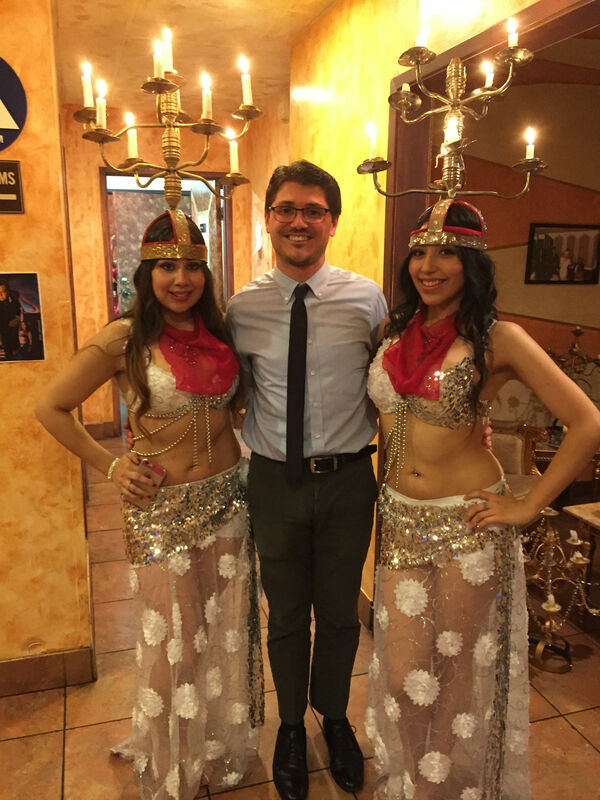 During dinner we met a man and his date who were very pleasant and talkative. Shortly before the show started, we met two other people as well, one of whom is actually part of the dance troupe but wasn’t dancing. It was great talking to them as well, although we didn’t get a lot of time. Okay, but what about the Fourth of July?! Whoops, I didn’t take a lot of photos. Kaylin and Andy hosted a party at their apartment. Here’s one photo I took – burgers, tomatoes, and bacon cooking in delicious bacon grease. When gem, Duncan, Matt, and I arrived, Mariam was already there. I don’t know her well, but we’ve talked before, and it was nice chatting with her. Collin, Niki, Joseph, and Mariana arrived later. We ate a ton of delicious foods, had some great conversation, and played Werewolf and Cards Against Humanity. gem and I also took a short break from the party in the middle to visit Anela for costume help (and to deliver some food). It was a great Fourth! And there was also Friday. 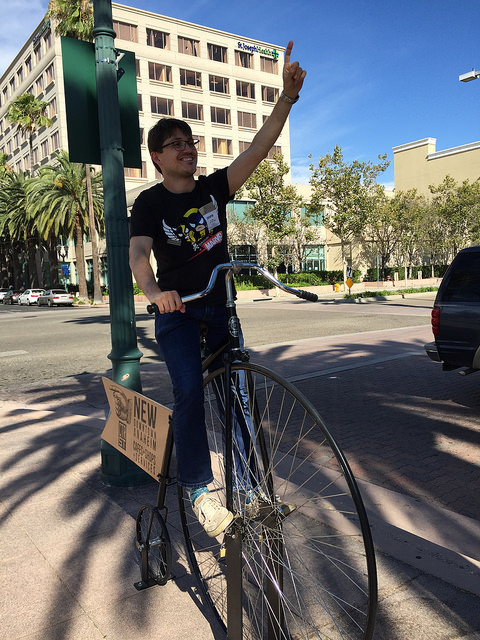 I went ice skating in Anaheim and climbed on this bike outside. 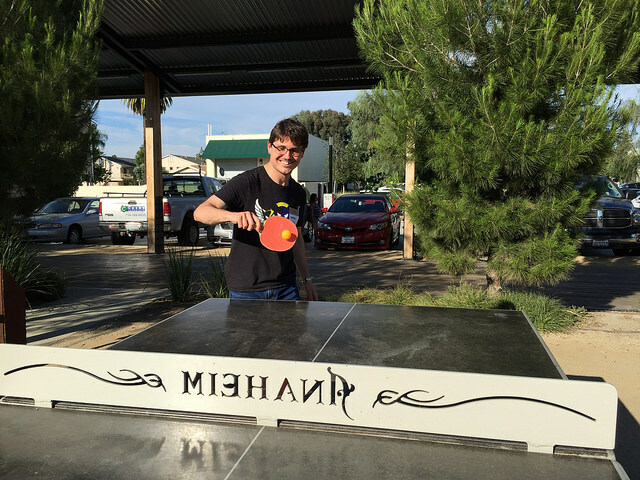 I also played ping pong at the Anaheim Packing District. Did you know you could rent paddles and a ball for free? Awesome! What a fantastic weekend! And now I’m off to San Diego Comic-Con for what I can only assume will be another great weekend. This entry was posted in Art, Events, Food, Journal, Photos and Screenshots, Shows, Videos and tagged andy, anela, belly dancing, cards against humanity, collin, duncan, fourth of july, holiday, independence day, joseph, kaylin, mariam, mariana, niki, party, werewolf on July 8, 2015 by TheUser.